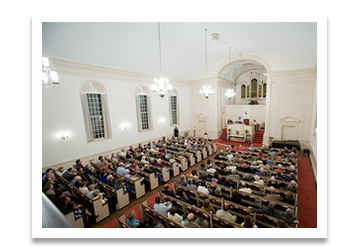 Trinitarian Congregational Church is located at the intersection of Walden and Hubbard Streets in Concord center. For the afternoon of September 25, 2016, the church parking lot, located to the left of the building, will be reserved for handicapped parking only. Additional space for handicapped parking will be reserved in the Post Office lot on Hubbard Street, across from the side entrance to the church. General parking will be available on-street and in the municipal lot located off Walden Street, a half block away from the church, accessed via a one-way entrance near the intersection with Main Street. The church has two handicapped accessible entrances, one on Hubbard Street and one beside the church parking lot to the left of the sanctuary. If you have special requirements for parking, we invite you to contact us via email at info@alfilipov.org. We will do our best to accommodate everyone, but space is limited, and we encourage you to arrive early. Doors will open at 3:15 pm.